We are posting a two-part panel today on part-time and irregular work schedules in the United States, with WIP regular contributors Christine Williams and Martha Crowley responding to a recent New York Times article by WIP favorite Steven Greenhouse. Based on her qualitative research on low-wage service work, Christine discusses how irregular work schedules operate as a mechanism to reproduce gender and racial inequality in the workplace. Martha discusses recent efforts of women’s and labor groups to introduce legislation allowing workers to have more predictable schedules if desired. She cites evidence that irregular schedules are particularly damaging to low-wage workers and that more stable work schedules would benefit workers and employers. Bad jobs are usually defined as those with low pay, little autonomy, and few benefits. Add to the list irregular hours. 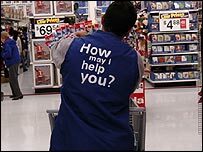 As Steven Greenhouse describes in his New York Times article on the part-time labor force, workers today are suffering from erratic scheduling. In the service industry, employers routinely cut their hours or send them home early when customer traffic slows. On the flipside, workers are required to be on call or stay late during especially busy times. Erratic hours not only mean income insecurity, but also result in the inability to do anything else, like search for a second job or take a class. Anyone who has worked a nonstandard, part-time job is familiar with the issues: uncertain hours, fluctuating pay and last-minute change. Add to that a more recent scheduling innovation increasingly common in retail work: on-call hours that require workers to set aside time they may be required to work, with no compensation for that time and no guarantee of hours or pay. Variable schedules are particularly challenging for parents, who can find it difficult to arrange childcare, attend school events, and even maintain morning and bedtime routines. Fluctuating schedules can interfere with ability to attend school or hold down an additional job. Because pay varies with hours, workers may also have difficulty making ends meet. In response to demands of women’s and labor groups, government officials are increasingly enacting or proposing legislation aiming to curtail practices that present the greatest challenges to employees. Many workers have gained the right to request predictable schedules (although laws currently do not require employers to honor their requests). Other proposals call for work schedules posted two weeks in advance, compensation for on-call status, and extra pay if workers are called in with less than 24-hours notice or are sent home after just a few hours of work.